Iten-based Kenyan Riders team swept the top three slots in the 10th edition of Cycle with the Rhino event used to raise funds towards fencing Lake Nakuru National Park and awareness among the general public held at Lake Nakuru Park on Saturday. 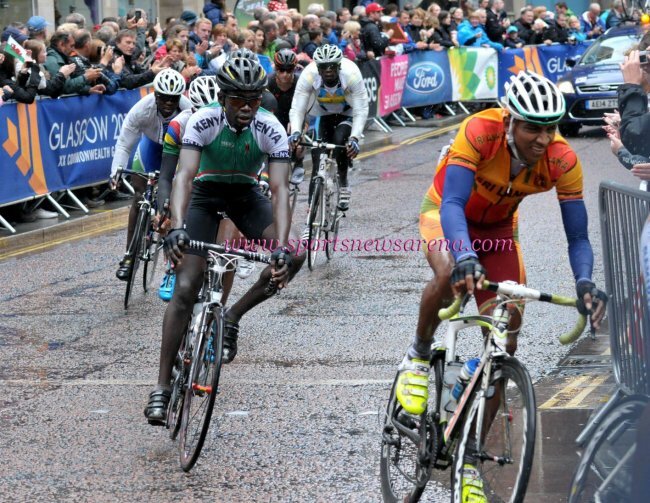 Pauli Ariko, one of Kenya’s road race cyclists at the 2014 Commonwealth Games in Glasgow, Scotland cruised to victory clocking 3.55.21 to win the newly introduced 140km course. The former potato vender who also used his bicycle to ferry people in Nakuru before he was spotted by the Kenyan Riders club managed by Australian Simon Blake said the low altitude Nakuru provided an easy time for him since he has been training ta the high altitude, Iten. “I started riding in 2004 before I was spotted in 2007 leading to my contract signing in 2009. I have represented Kenya in Commonwealth India, Tour of Egypt’s thrice, Tour of Rwanda five times, Tour of Eritrea three times and Tour of Gabon thrice,” Said Ariko, who didn’t finishthe grueling Glasgow road race owing to harsh weather, a race that only 12 of the 153 starters finshed. Ariko says Nakuru’s race, distance and course was good for him as he prepares for an eight-day Tour of Rwanda slated for November this year. Joseph Gichora (Kenyan Riders) came second, 40 microseconds behind Ariko as co-trainee Samuel Mwangi, winner of the seventh edition coming third in 3.56.15. “The race course was long. We applied our tactics despite the hard course and that is what helped us emerge winners,” said Mwangi. Team Kenyan Riders club has some of its riders invited for a Tour rider in Asia this year, in what Ariko said will provide an opportunity for other riders in the team to try their ability. In the 2014 Commonwealth Games, Kenya Riders had Paul Ariko, John Njoroge and Suleiman Kangangi in accompanied by David Kinja, Samson Gichoro and Antony Muite. Antony Mwite won the 64km amateur category by posting 3.12.44, followed closely by Kenneth Kayla and Samson Gichoro who clocked 3.15.10 and 3.22.1. Victor Kibet won the junior category (9.32) while Joyce Nyarur won the ladies’ amateur 64km category in 4.2.30. KWS Acting Director William Kiprono lauded the event, saying it is picking up in addition to raising new talents.